Baba Ramdev’s venture Patanjali has grown so fast that people started trolling it in various social networks. Many of us have seen various funny pictures and different types of imaginary products from Patanjali. But finally, Baba Ramdev today unveiled it’s all new Patanjali Sim Cards. Yes! You heard right. Baba Ramdev is now entering the telecom market of India with his Swadeshi brand Patanjali. 1.2 Which Benefits Are Offered Along With Patanjali Sim Cards? 1.3 Who Are Considered As Patanjali Members? 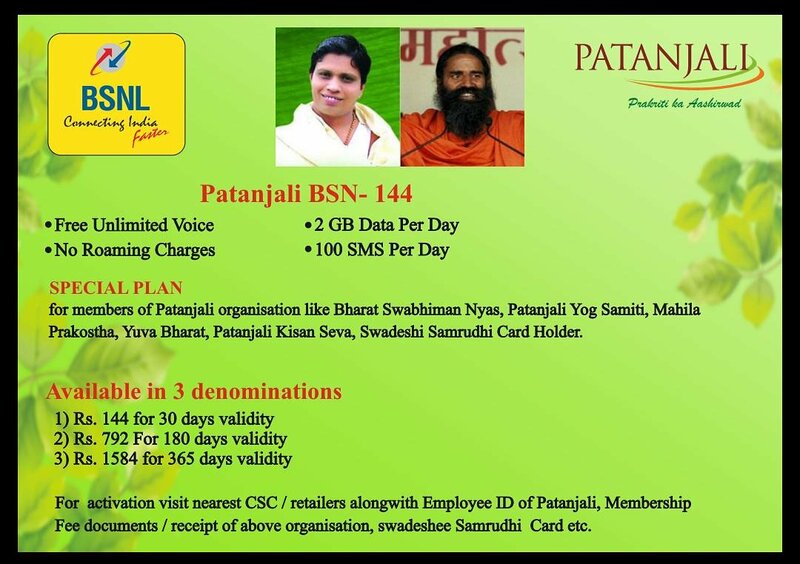 1.4 How To Apply/ Buy/ Get Patanjali Sim Card? Reportedly, Patanjali is going to launch it’s new SIM Cards which will be known as Swadeshi Samdriddhi SIM Cards. He has already partnered with the state-run telecom operator Bharat Sanchar Nigam Limited to fulfil this project on Patanjali Sim cards. Baba Ramdev himself and the whole community of his belief in Swadeshi. For the same reason, he has chosen BSNL to serve this purpose as BSNL is India’s telecom operator. Apart from that Patanjali has already launched a new tariff plan called BSNL Patanjali Plan, where users will get data benefits with unlimited voice calling for 30 days at Rs 144 only. We will discuss in more details about this new BSNL Patanjali plan below in this article. For employees of Patanjali, the service has been started already. But normal people, as well as the normal public, will be soon introduced to the whole telecom service of Baba Ramdev’s Patanjali. Not only that, users who are anyway a member of Patanjali will also get some exclusive discounts on the pricing of Patanjali products. Update 30 May 2018: BSNL and Patanjali tie-up is only for employees of the company and linked organisations. Patanjali are not entering the telecom sector to launch their own SIM cards. That’s only for company employees, not the general public. As mentioned earlier in this article, that Patanjali has partnered with Bharat Sanchar Nigam Limited (BSNL) to make this happen in reality, BSNL users as well can avail this plan. But for members of Patanjali and the Swadeshi Samriddhi Sim Cardholders will get extra benefits with this too. Now come to the BSNL Patanjali plan details and benefits. The plan offers 2GB of high-speed data per day. Along with that, users will also get unlimited voice calling to any network excepting the Mumbai and Delhi circle. 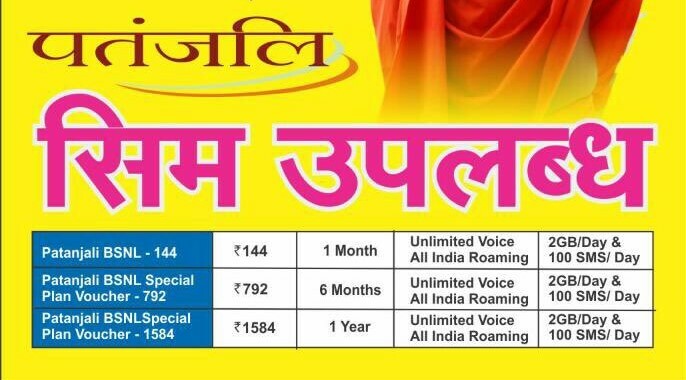 And the voice calls do not have any limit like other telecom operators. Roaming calls are also free of cost. Apart from that, users will also be given 100 of SMSes each day. The whole plan comes with the validity period of 30 days. The final price of this plan has been set to Rs 144 only. I also think that this all-new BSNL Patanjali Plan will serve most of the user’s purpose as 2GB of data and 100 SMSes a day are more than enough for normal internet users. And not only that, if users subscribe for a longer period at once, they will be charged less than the actual price of the plan. For this, it has provided three different subscriptions. First one comes with 30 days of validity at Rs 144 which is normal, then for the 180 days validity, it will charge Rs 792 instead of Rs 864. So, with the second subscription plan, you are saving Rs 72. And the third subscription plan comes with 365 days of validity period at Rs 1584 where the actual price should be around Rs 1752. So, there, you will save Rs 168 by availing the plan for the whole year of the validity period. Which Benefits Are Offered Along With Patanjali Sim Cards? First of all, I would like to mention that, both Patanjali Sim cards and Swadeshi Samriddhi SIM cards are two different names of the same thing. So, do not be confused with these terms. Both represent the same. With, these Patanjali SIM cards, you will get exclusive tariff plans which are not available with any other telecom operators. But that is not enough as all the major telcos like Reliance Jio, Airtel, Vodafone, etc. are offering very competitive pricing for almost save benefits. But there are some extra benefits and advantages which are available exclusively only with Baba Ramdev’s Patanjali Sim cards. Once you get one for you by submitting all the required documents with the process described below, you will also get free health, accidental and insurances. Reportedly, in an interview taken by a news reporter, Yoga Guru Baba Ramdev’s has told that the Patanjali Sim cards also known as the Swadeshi Samriddhi Sim Cards will offer medical insurances worth Rs 2.5 lakh and life insurance worth Rs 5 lakh too. However, the insurances are available in case of road accidents only. Apart from that, in the same interview, Baba Ramdev also said that the whole SIM card concept is for prosperity for charity. And the list of benefits does not end here. Swadeshi Samriddhi sim card holders will also get extra 10% discount on all the products made by Patanjali. What do you think? Is not it great news? Who Are Considered As Patanjali Members? Well, we have told that Patanjali members will also get these benefits. But many of you might be wondering who is considered as Patanjali members. Well, the members of different organisations under Patanjali such as Bharat Swabhiman Nyas, Patanjali Yog Samiti, Mahila Prakostha, Yuva Bharat, Patanjali Kisan Seva, etc. are considered as Patanjali members and will get all of the benefits of BSNL Patanjali plan. But the Patanjali employees can access this plan and enjoy all the benefits available with this BSNL Patanjali plan right now. Baba Ramdev will soon open this plan for normal public too. How To Apply/ Buy/ Get Patanjali Sim Card? First of all, visit your nearest Patanjali retail store. Submit your documents which are required. Provide your biometric data and Aadhaar card number if needed. That’s it. These steps should get you a brand new Patanjali sim card. So what are your thoughts on Baba Ramdev’s Patanjali sim cards right now? Will you go for this once it is available in your city? Or you are already happy with your existing operator? Please answer these questions in the comment section below and let us know what you are thinking about this entry of Patanjali into the Indian telecom market.